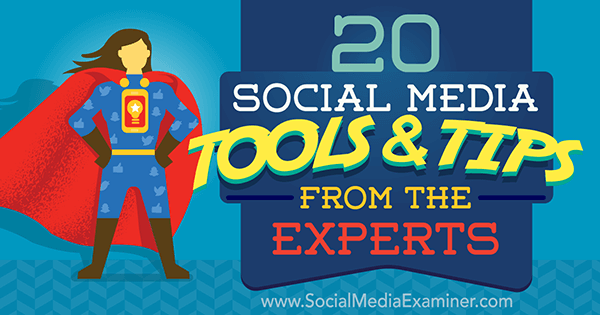 We asked top social media experts to share the tools and tactics they’re using right now. In this article, you’ll discover 20 ways you can stay ahead of the social media marketing curve. 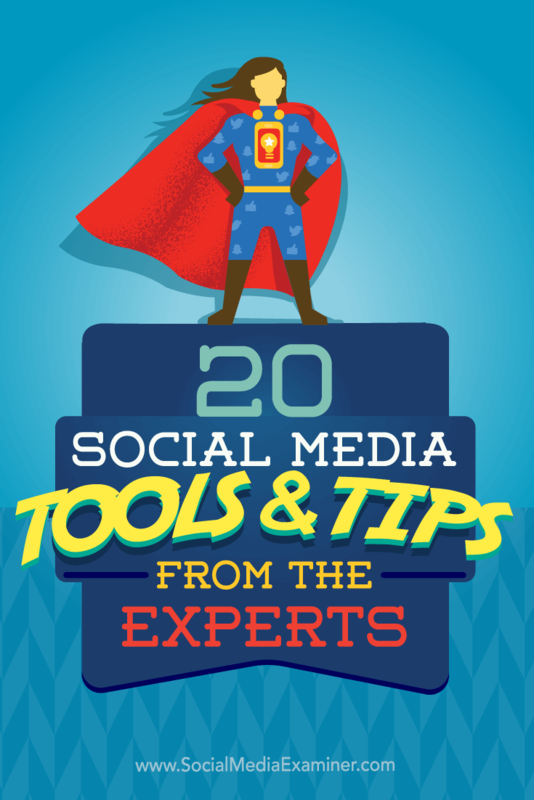 Discover 20 social media tips and tools from the pros. 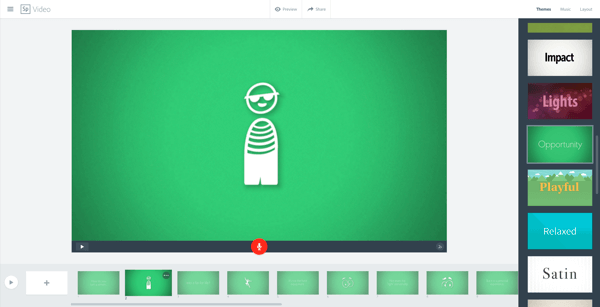 Ripl is an easy-to-use app that allows anyone to create animated social media posts in a short video format. If you’re not savvy with video, Ripl is a great way to create videos without needing any tech or creative skills. 3. Write a caption, add hashtags, and share! Ripl brings your text and photos to life in a short video. The basic or free plan allows you to choose a range of styles, fonts, colors, and music. You can easily share to Facebook, Twitter, and Instagram and overall the free version gives you plenty to play with. Ripl is currently only available for iPhone, but they’re reportedly working on an Android version. For more examples and inspiration, check out Ripl’s Instagram feed here. Math is hard. Or at least it’s not fun. But some insights aren’t in just one analytics report; you need to pull data from several reports and crunch numbers. For years, I’ve had to squeeze insights out of my analytics by copying and pasting things from several reports into spreadsheets. Not fun. One example: I like to see the performance of each blog post by measuring its conversion rate. 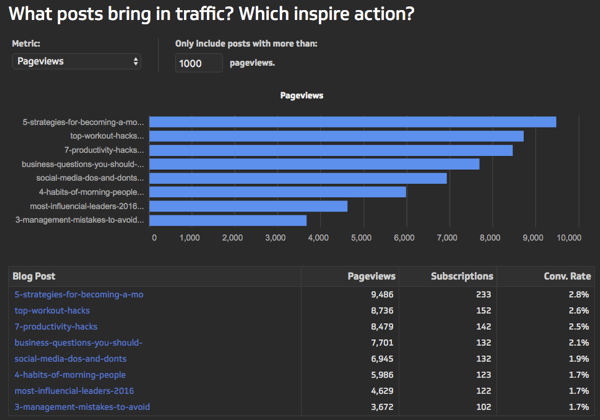 I can find out which blog post inspires visitors to subscribe to my newsletter. But it takes a lot of work. See those numbers in the bottom right? That’s the conversion rate from visitor to subscriber for every blog post on your site. It’s right there. No math required. Setting up this dashboard for your data takes only a few clicks. Brilliant. Thank you, Klipfolio! With the launch of Instagram advertising, Facebook page managers can now create an ad that will run on Facebook and Instagram, even if they don’t have an Instagram account. This is a smart spend of your advertising dollars since you can create one advertisement and reach two unique audiences on two different social media platforms. And the newest way to reach people is with Facebook’s Slideshow ads. Facebook says these ads “work on low connectivity, so they allow you to reach more people worldwide.” The new ad format is “optimized to work across almost all Internet-connected mobile devices” and designed to consume less data than video, reducing ad load times and data cost for the viewer. To create your first slideshow ad, go to your Ads Manager and click Create Ad. Select any objective (except Page Post Engagement or Local Awareness), and go to the Video section. Now, click Create Slideshow, then upload 3-7 images. When you’re finished uploading images, click Create Slideshow again, and then select a thumbnail and choose the length of your ad. Creating an interesting ad to reach Facebook and Instagram users is easier than ever. You can add transitions, choose the image duration, and even add music or narration. It’s easy and inexpensive to create something unique you can promote on Facebook and Instagram. I’m super-excited about Huzza.io. It’s what everyone hoped Blab would evolve into. 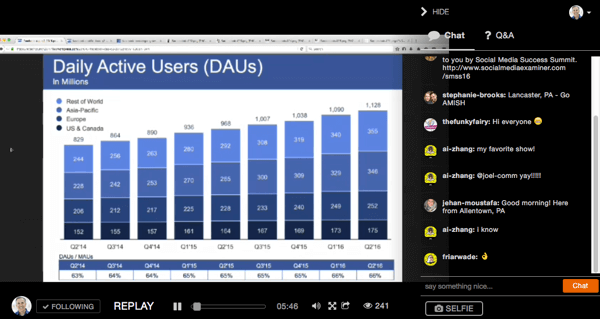 Huzza allows you to broadcast a live show with up to six guests at once and simulcast it to Facebook. The platform provides real-time interaction, full-screen sharing, and so much more. One of its most valuable features is users’ ability to subscribe to your show and get a reminder via email 30 minutes prior to a live broadcast. Now your followers don’t ever have to miss an opportunity to tune in! We’ve all seen the power of retargeting and lookalike advertising on Facebook; whether as an advertiser trying to reel in uncommitted browsers or as a consumer who feels pursued by that last pair of running shoes you were contemplating. But did you know that Pinterest now offers something similar? That’s right! You can target visitors to your site or an uploaded list of contacts, and create lookalike lists for both. The conversion rates from Pinterest to website lead or sale tend to be much lower than traffic referred by other sources. It’s just the nature of pinners. But if the pinners who see your ads already know you and your site, you’ll see your conversion rates rise as well. Interestingly, the targeting options you choose will determine not only the cost per click or engagement, but also the placement of your promoted pins within Pinterest. 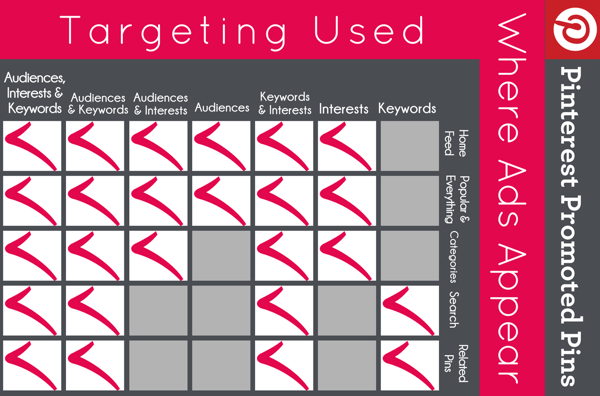 Understand how targeting affects your visibility on Pinterest. Audience targeting alone gets your pins displayed on the home feed, which in a small test proved for me to be the most rewarding location in terms of CPC and repins. Combined with keyword targeting, audience targeting is a great (and affordable) way to get your promoted pin displayed in every possible location on Pinterest. You can choose to include or exclude specific audiences. It’s also easy to exclude audiences. Why might you do that? Well, if you have one audience of people who visited your registration page, you don’t have any way to know which of those are now members on your site – and you don’t need to target them to get more registrations! So you can upload an email list of your existing members and exclude them from your targeting. The possibilities for reducing cost and improving effectiveness are nearly infinite! 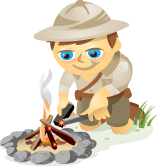 Perform your own tests by using identical images and descriptions but different targeting options. Then export your results and look at what’s performing best for the least amount of money. Once you’ve found the perfect combination for your pins, setting up your future campaigns will be a cinch and your costs will be as low as can be! Alisa Meredith is co-owner of a HubSpot partner agency, and content and social media consultant for other agencies and small businesses. My favorite new marketing tool is Meet Edgar. I like the flexibility of creating queues of content and the ability to look at limited stats after that content posts. Edgar has simplified our posting schedule by allowing us to post a recipe at noon and then a kids’ activity at 1 PM. As we continue with Edgar and the content in our queues is tweaked, updated, and replaced, our queues are getting better and better. Holly Homer runs Kids Activities Blog and Quirky Momma Facebook page, and writes about blogging and social media strategies at HollyHomer.com. Audio is absolutely critical for any video, and going live on Facebook or YouTube is no exception. When streaming from a smartphone, many entrepreneurs default to using either the phone’s built-in microphone or some basic headphones. Unfortunately, the sound quality is poor and they pick up a ton of background noise, which can lower the quality of your videos. It’s easy to boost the quality of your videos and stand out by using a low-cost lavalier microphone that plugs right into your smartphone. I’d recommend checking out the BOYA BY-M1, which works with both smartphones and DSLRs and sells on Amazon for under $20 U.S. Pro Tip: If you’re interviewing someone live, grab two of these mics and plug them both into your phone using a 3.5 mm splitter, and you’ll have great audio. Just make sure you grab a 4-pole/TRRS splitter, so it works with your microphones. Justin Brown, a leading video production specialist, teaches his methods for producing better video content faster at PrimalVideo.com. TubeBuddy, a browser plugin, helps you optimize your videos to rank well in YouTube search and also offers some great productivity features. Organic SEO ranking is an important part of getting your content discovered, and TubeBuddy allows you to explore and optimize titles and search queries that help your videos perform better and rank on the first page of YouTube. From a productivity standpoint, it helps you publish your videos from YouTube directly to Facebook as a native upload. You can also analyze your videos and find the ideal times to upload. For comment management, you can even identify questions from your audience or prioritize comments you haven’t replied to yet. Overall I would consider TubeBuddy to be one of the most powerful tools video marketers on YouTube could hope to have in their arsenal. 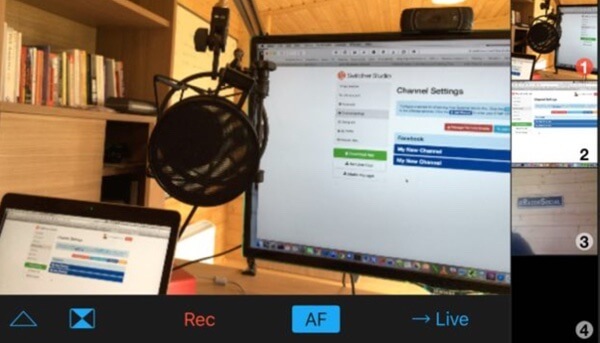 Switcher Studio is a free iPhone app for live streaming. The app picks up any camera that’s available on your wireless network so you can use any of them for your live stream. That means you can easily broadcast from one camera source and easily swap to another camera source. For example, you can have one camera positioned face on and another camera to show a side view of you. You could even have a third camera to show your desktop. You swap back and forth with any cameras by clicking on the view of the camera you want. The large image below shows the view of the camera currently on live stream, and the right hand side shows you the cameras that are available. You can also record live streams from within the app. It’s easy to see which camera views are available. It’s a little complicated to set up, but you’ll enjoy using the app. I enjoy using social networks that give me precise vision into how I’m doing inside their network. At this point, I believe that the most robust analytics are currently being provided to users of Twitter, not Facebook as you might imagine. What I love about Twitter Analytics is its very intuitive user interface, which allows you to find and export relevant information extremely quickly. Need to understand your daily or monthly impressions? Done. Average engagement rate per tweet? Done. Average link clicks, retweets, or likes per day? Easy peasy. Twitter Analytics gives you valuable insights on engagement. 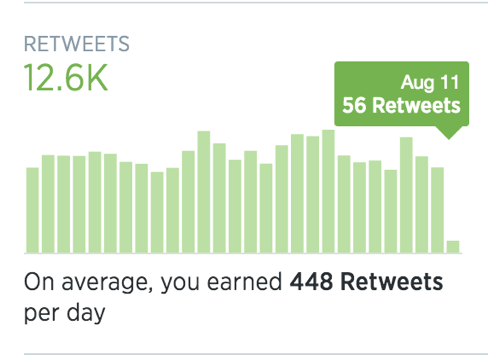 One powerful feature of Twitter Analytics is the ability to export all of your tweets and see engagement metrics at a level of detail that I’ve yet to see emulated properly in a third-party social media dashboard. Here’s a complete list of what data you can extract for each tweet you post: Impressions, Engagements, Engagement rate, Retweets, Replies, Likes, User profile clicks, URL clicks, Hashtag clicks, Detail expands, Permalink clicks, App opens, App installs, Follows, Email tweet, Dial phone, Media views, and Media engagements. Twitter also provides robust analytics on your follower demographics, providing you with information on their interests, occupation, consumer buying styles, wireless carrier, household income, net worth, home value, and more. You can learn a lot about your followers’ interests and demographics. You can even compare your followers’ demographics with those of other audiences, including Twitter users in general. This will give you a good feel for the uniqueness of your audience and how you should optimize your content and ad campaigns for maximum social media marketing effectiveness. Neal Schaffer, founder of PDCA Social and the social media strategy consultancy Maximize Your Social, is the author of three books and an educator at Rutgers University Business School. A great way to stay top of mind, create conversation with existing connections, expand your reach, and increase potential for connecting with new people is to take advantage of engagement from people on LinkedIn Publisher. 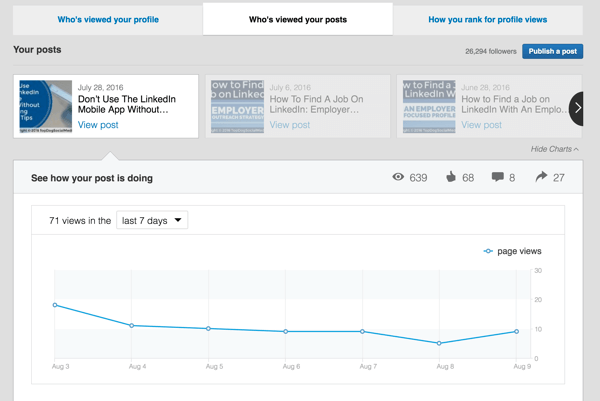 To do this, you need to go to the Analytics page of your latest LinkedIn Publisher post. Start by hovering over Profile in the top navigation bar and clicking Who’s Viewed Your Profile. Click on Who’s Viewed Your Posts at the top of the page, and you’ll see the stats for the last seven days for your latest post. Now scroll down the page to Who’s Responding to Your Post. You can click on Likes, Comments, or Shares to see a list of people who have taken that action. See who’s engaged with your Publisher posts. To begin, go through and respond to any comments. You also want to respond to everyone who has shared your post. These people have not only read your post but have taken the time to share it with their network. It only takes a minute to thank each person, which can be a great way to get a conversation going. Pay attention to what level of connection the person is. If you don’t have a first-level connection, this can be a great reason to send a personalized connection request. To respond to each share, click the three little dots located in the bottom-left corner of each connection box. Here you can Like (thumbs up) their share and then click the View Share link to be taken directly to their post where you can thank them or reply. Comment directly on the share of your Publisher post. 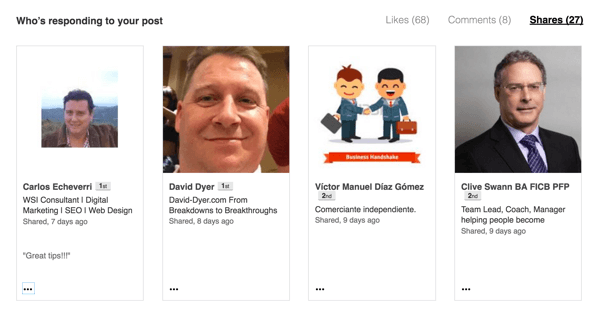 With just a small investment of time and effort, you can maximize the benefits you get from posting on LinkedIn Publisher by connecting and having conversations with the people who are engaging with you and your content. Melonie Dodaro is the author of The LinkedIn Code and the founder of Top Dog Social Media. When it comes to driving more sales using AdWords, it still surprises me how many businesses haven’t connected the dots among Google Analytics, Google AdWords, and YouTube. 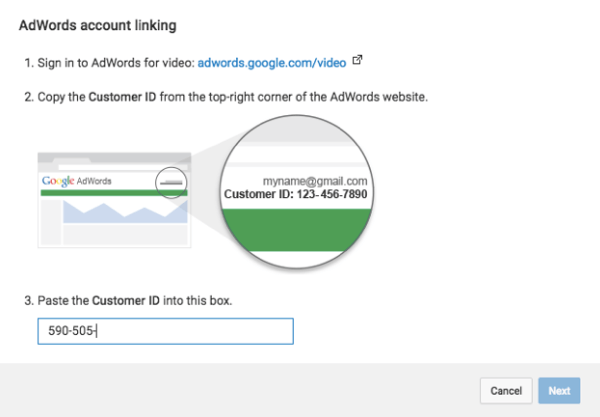 By connecting your AdWords account to your YouTube account, you’re able to build lists of people who have engaged with content on your YouTube channel, including people who have subscribed, commented, shared, or liked a video. You can remarket to your YouTube viewers. Now here’s the thing: you can’t gain access to a historic audience on YouTube. 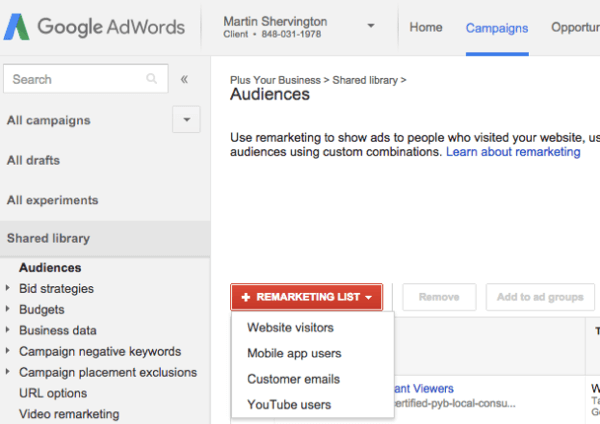 If you don’t have your accounts linked, you won’t be able to re-engage with them; the first thing you need to do right now is go to your AdWords account and link it to your YouTube account. 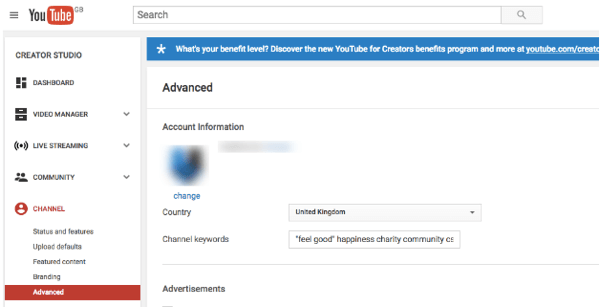 Find the Advanced section of YouTube Creator Studio. While you’re in this section of YouTube, make sure you’ve added an associated website, then connect your Google Analytics. Finding good analytics and monitoring tools for Instagram can be difficult. It often requires multiple tools. But when Agorapulse recently released their support of Instagram management, they solved a lot of those frustrations for Instagram account managers. The Agorapulse dashboard allows you to manage your Instagram account(s) for engagement by responding to comments, leaving comments, and liking other users’ content. You can also schedule posts to Instagram to better organize your posting strategy. Beyond that, you can locate your brand ambassadors through hashtag monitoring and location tracking. You can track and monitor your engagement with real data and trend analyses to see what’s working for your campaigns and content strategy. And if you manage client accounts or want to wow your boss, you can print out all of your analytics in well-organized PowerPoint presentations with your own custom branding. When using template apps like Canva, Ripl, or Adobe Spark Post, try to mix up the templates from the defaults provided as much as possible. For Canva, create another page and mix layouts from one template with fonts from another. In the Ripl app, use your brand colors and pay to have the Ripl watermark removed and replaced with your own. For Adobe Spark, use the suggestion wheel and count how many times you go around the wheel to remember the best-looking layout for your text. The more you’re able to stand out in the feed with original-looking images, the better off you’ll be in the long run. Jeff Sieh, “head beard” at Manly Pinterest Tips and host of the Manly Pinterest Tip Show, is creative director at His Design, Inc.
Did you know that more than 50% of LinkedIn’s traffic comes from mobile devices? 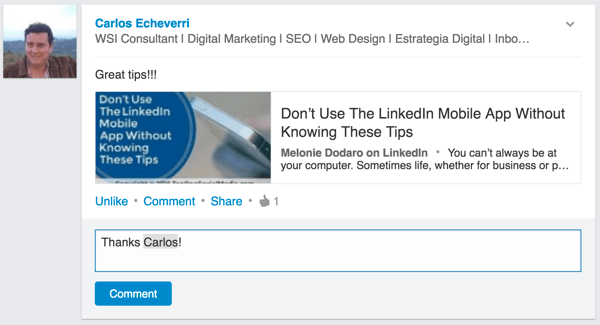 My best social media marketing tip (and tool) is the LinkedIn mobile app. It’s available for both iOS and Android devices. You can do almost everything you need to do to stay relevant on LinkedIn through the mobile app these days. To participate in LinkedIn groups, I recommend using the LinkedIn Groups mobile app. For job searches, you might try the LinkedIn Jobs mobile app. Learning to use the LinkedIn mobile app can help you become more efficient with your networking and grow your influence on the go! Stephanie Sammons, author of the #1 Amazon best-seller Linked to Influence, is a digital business, marketing, and personal success strategist. At Foundr, we’re always asked how to get more followers on Instagram and how to use the channel as a tool to grow your business. The answer is simple: consistently post extremely valuable content that’s relevant to your target market and niche. As you can see, we’ve had consistent growth since we started in November 2014; we’ve only missed a single day of posting since inception. So if you want to grow any social media channel, remember: you have to play the long game. It takes a very long time to grow anything. It won’t happen overnight, but if you show up every single day and post cool stuff for your market, you can’t lose. Watson’s developer platform, Bluemix, provides marketing technologists and social media developers with access to one of the world’s premier artificial intelligence platforms. Got social media content you want to analyze? Need insights on a million tweets at a time? Watson can handle what cripples most other analytics software. I’m using it on a daily basis to analyze social media feeds, company websites, and much more to inform my social media strategy. Here’s an example of Tone Analyzer, dissecting an original email by emotion, language, and social tendencies. Watson indicates a strong degree of conscientiousness, which I appreciate. 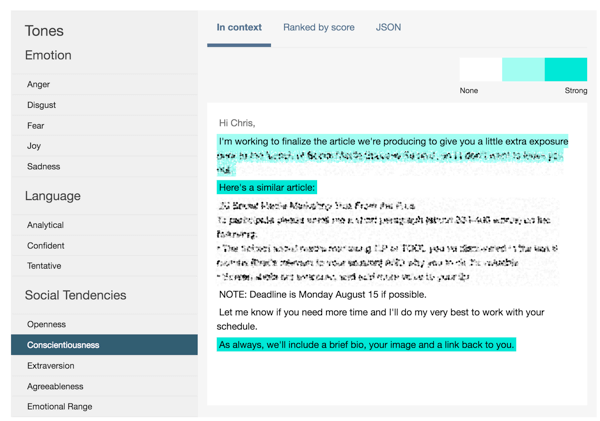 Use Watson to quickly analyze the language of posts, emails, and more. Now imagine using this software on Facebook posts, LinkedIn articles, and social media content of all kinds. Imagine being able to understand at a glance everything your competitors are talking about. One of the best tools to be introduced in the video marketing world is Adobe Spark. For so many, the struggle with creating video content is simply getting started. It’s not always possible to turn on a camera to share your valuable brand message. Adobe Spark allows you to put your words and photos into a visually pleasing video format that takes the stress out of everything. Spark makes it easy to create engaging video. Those assets you would use to create a basic Facebook status update? 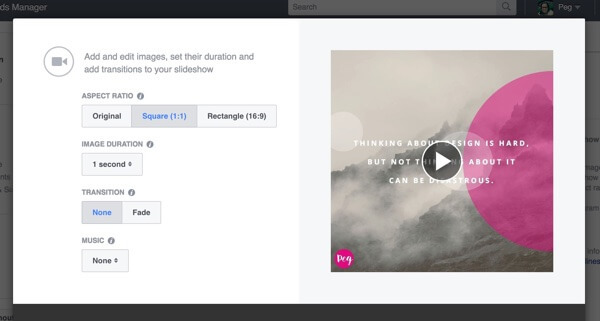 You can throw them into a custom template in Adobe Spark to create a video, giving you an incredible native upload that will get a lot more attention on the news feed, expanding your organic reach. Curating great content is time-consuming. Every day you’re bombarded with noise on social media, and your news feed is clogged with irrelevant stories. RSS feels like a tangled mess. But thanks to Nuzzel, you can stop wading through all of the clutter to get to the good stuff. Nuzzel is a nifty tool that takes the very best of your Facebook and Twitter stories and feeds them to you via desktop and mobile app. So it’s easy to share great stories to your social media accounts. 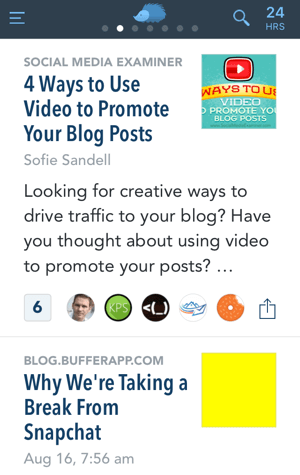 Plus Nuzzel integrates with Buffer so you can share content right to your queue. Here’s how it works: Nuzzel suggests stories based on the number of times they’ve been shared by those you follow. For instance, I follow lots of social media marketers, thought leaders, and digital marketing experts. My Nuzzel feed is chock-full of articles related to the field of social media marketing. Every day I see timely stories from sites like Search Engine Land and Entrepreneur, plus a few smaller blogs. It’s great content easily available to me without the headache. My time spent on content curation is easily cut in half thanks to this useful tool. Nuzzel serves up content that matters to you. A few other key features are the ability to search stories from friends of friends, your Twitter lists, and keyword search. You can also share a daily newsletter from your Nuzzel feed. Subscribers receive an email containing the top five stories in your feed every day. Whether you’re at your computer or on the go, you’ll love reading and sharing the relevant content available at your fingertips. Want the most cost-effective method of advertising to reach local 13- to 34-year-olds in the U.S.? Look to Snapchat geofilters. A branded Snapchat geofilter costs as a little $5 for 4 hours over a 20K square-foot radius and can be placed virtually anywhere. Geofilters provide Snapchat users with a branded, interactive experience they can engage with to create content to share with their friends, followers, and neighbors; all while showcasing your brand’s messaging or likeness. The key to running a geofilter to reach younger consumers is to place it in high foot-traffic locations such as a busy shopping mall on the weekend, a Friday night high school football game, even a college job fair or student orientation event. Example of stats from a geofilter. 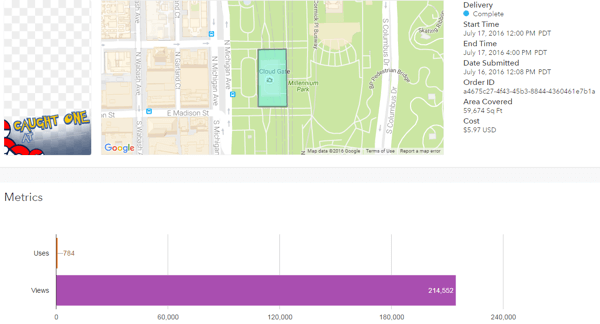 As an example, I recently ran a Snapchat geofilter at the iconic Bean in Chicago, IL at Millennium Park on a day when over 10,000 Pokémon Go gamers attended a meetup. For $5.97, I ran my geofilter around the perimeter of the event (59,674 square feet to be exact) for 4 hours. The result? My filter was used 784 times in snaps and seen 214,552 times within a 24-hour period. Carlos Gil is the global head of social media for BMC Software. The social media marketing experts who contributed to this article are all presenting at Social Media Success Summit 2016. You’ll soak in 39 social media marketing sessions taught by the top social media pros, including Mari Smith (co-author, Facebook Marketing: An Hour a Day), Michael Stelzner (founder, Social Media Examiner), Kim Garst (author, Will the Real You Please Stand Up), Joel Comm (co-author, Twitter Power 3.0), and Amy Porterfield (co-author, Facebook Marketing All-in-One for Dummies), just to name a few. They’ll share their latest social media marketing tactics with you. You can check out the entire agenda and see what’s in store. 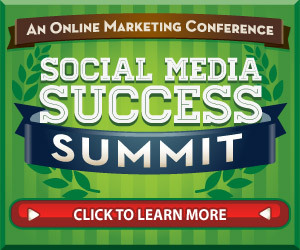 Attend Social Media Success Summit and you’ll discover the best and newest ways to market your business on Facebook, Instagram, LinkedIn, YouTube, Twitter, Pinterest, and Snapchat. You’ll also find new ways to improve your content and measure your results with sessions on video, live video, visual marketing, analytics, and marketing tools – all from the comfort of your home or office. What do you think? Will you try any of these tips or tools? Which are you most excited about? Share your thoughts in the comments below. 20 ways to up your marketing with expert advice.